A Professor of journalism from Northern Kentucky University, named Brad Scharlott, has fired up the Palin watchers on the web with the draft of a paper titled, "Palin, the Press and the Fake Pregnancy Rumor." Downloads and excerpts have been published and are certain to provoke heated fresh debate. 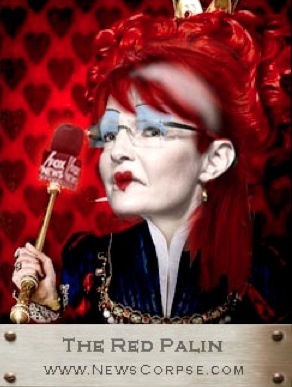 Hopefully Sarah Palin, an insignificant sociopath, will fade away and never become the lipsticked face of fascism, carrying a bible and wrapped in a flag. As shown in these Palingates videos, the larger question is the subservience of the media to their corporate masters, and the distortions, outright lies, and lies of omission that they perpetrate. There have been enough glaring examples, from the blatantly phony excuses to invade Iraq to the ongoing coverup of the real damage done in the Gulf by BP, to come to the sorry conclusion that Americans are bombarded with propaganda from the teevee, radio, and press, and our government is a wholly owned subsidiary of Blackwater, Koch Industries, and Monsanto. Maybe the paper by the good professor will help expose the media so that the public can wake up out of its stupor and demand accountability on a host of issues that threaten us, from climate change to pollution to gutting social service safety nets. Hopefully, the faked preg. story will be taken up as it should have been for scrutiny because anyone who would make up and act out this "wild ride" story is at least an incompetent and a poser, and at most an embarrassment to our nation and women everywhere. She was and is not a contender for the presidency, but she is a liar who would hurt our nation. Great post Gail! This is both important and instructive. "A quick review of the spiral of silence theory: individuals who sense that their views are outside of what the mainstream of society considers acceptable will censor themselves, so as to not be subject to scorn or rejection by those in the mainstream. The more individuals who hold a minority view censor themselves, the more outside of the mainstream the minority view will seem"
Hmmm what other issues will purposefully use the spiral of silence to influence opinion?? ?